Seth MacFarlane may be one of TV’s most profitable players with Family Guy and American Dad, but with his feature film outings he’s had somewhat mixed results. While Ted, his 2012 live-action debut about a foul-mouthed teddy bear that comes to life, brought in over $500 million worldwide and earned a decent amount of critical praise, last year’s sophomore pic A Million Ways To Die In The West was perceived by many to be a gigantic dud both critically and commercially. All in all, a mixed bag theatrically. He’s certainly of the love-him-or-hate-him variety, and with Ted 2 – the sequel to his first major hit – he’s set to divide the fan-base all over again. How does it fare amongst his other work? The short version: better than A Million Ways…, but not quite up to par with the first film. The longer version goes into a bit more detail: Ted (once again voiced and motion-captured by MacFarlane) gets married to his girlfriend from the first film, Tami-Lynn (Jessica Barth), but when their marriage runs into trouble they decide to have a baby – only to be denied when it turns out that Ted, being a talking toy, is not a person and is technically declared property. 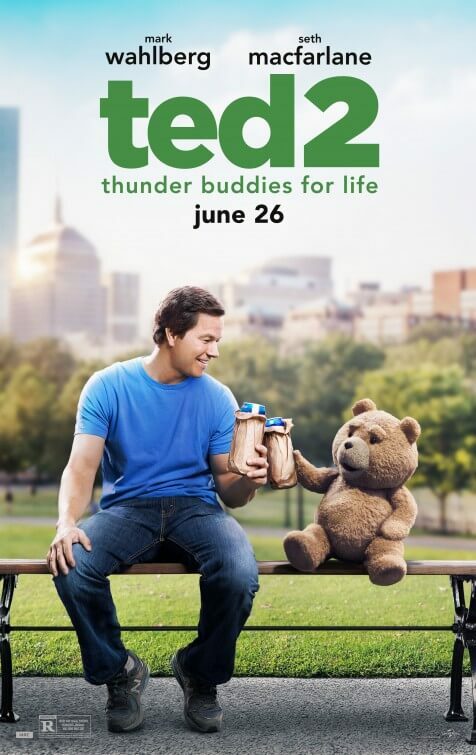 From there, it’s up to Ted, “thunder buddy” John (Mark Wahlberg) and young lawyer Sam L. Jackson (geddit? GEDDIT?!) played by Amanda Seyfried to fight the courts and prove that Ted is in fact a person. As you might have guessed, the sequel takes itself in a different direction than before, with Ted now being the absolute focus while Wahlberg’s John is relegated to supporting status. Wahlberg doesn’t have as much to do this time round other than act as the supportive best friend, and his storyline from the first is retconned in the first few minutes when we learn that he’s just divorced an absent Mila Kunis, who played his girlfriend in the first film. While it’s a shame to see his previous progression mean little to nothing in the grander scheme of things, he never feels out of place and is perfectly comfortable with acting alongside CGI characters by now (it worked for him in Transformers: Age of Extinction, didn’t it?). That said, if you couldn’t stand Ted before then you certainly won’t tolerate him here, especially now he’s the unquestionable lead. For us, he’s not too bad; brash, certainly, but never annoyingly so. When MacFarlane is able to scale back on his character’s obnoxiousness, that can lead to some good quiet moments that emerge from his mo-cap performance, and make you actually feel for a CG teddy bear of all things. Even when that isn’t the case, he’s not an awful character and we can think of at least a dozen that are far more insufferable, but it’s easy to understand why some people would be turned off by him. The charm is for the most part still intact, but not as often as it was previously; there’s a bit more of a mean streak this time which, while it doesn’t overshadow much of the film, does often distract itself from its overall focus. Basically, prepare for literal shots at early morning joggers, Comic-Con fans, the offices of Charlie Hebdo and many other targets of pop culture. Really, the film’s biggest problem is that it’s far longer than it really needs to be. At almost two hours, there are multiple plot lines that are drawn out and don’t seem entirely needed, like an early montage of finding a sperm donor for Ted and Tami-Lynn’s baby which includes breaking into the house of NFL player Tom Brady and culminating in a pretty messy incident at the sperm bank; and minor plot points which should only take four or five minutes to set up and resolve but take more than fifteen minutes to do so, such as a road trip to New York to meet with Morgan Freeman’s civil rights lawyer. As if the film wasn’t crammed enough, there are a few lame repeats of some of the plots and jokes from the first film, most notably the return of creepy stalker Donny (Giovanni Ribisi) who devises yet another plan to kidnap Ted with Hasbro, where he now works as a janitor. On an amusing note, Donny’s spoiled young son Robert, who he was originally kidnapping Ted for previously, has mysteriously vanished from existence – unless he really DID turn into Taylor Lautner in the end, which is funny to imagine. Overall, for a film that only exists because the first one was a huge hit, Ted 2 could have been a lot worse and stands as one of the better comedy sequels so far this year – though it’s still not on par with what came before.